Another new office building was just announced for Coconut Grove, marking the second in recent weeks after nearly 30 years. CocoWalk owners Federal Realty Investment Trust, Grass River Property and Comras Company plan to raze the eastern building on Grand Avenue and Virginia Street and build a five-story, 73,000-square-foot Class A building on the site, Grass River principal Tom Roth told The Real Deal. Just two weeks ago, Terra Group and Mayfair Real Estate Advisors announced plans to convert a parking garage at 2860 Oak Avenue into a mixed-use office building, citing the demand for office product and lack of available space in the neighborhood. Together, the two projects will add 140,000 square feet of office space to Coconut Grove. “We believe there’s plenty of pent-up demand to serve both projects,” Roth said, adding that he believes CocoWalk is a better location. One CocoWalk, designed by Beame Architectural Partnership, is the first phase of redevelopment for CocoWalk, which was purchased by the partnership in May 2015 in a deal valued at $87.5 million. The once-popular Mediterranean-style outdoor shopping mall has fallen out of style in past years. Roth said plans for phase two, which will focus on retail, will be announced in the coming months. The office building, geared toward global brands, media and technology companies, creative and financial firms, will be delivered in mid-2019. It will have four floors of office space above a level of ground-floor retail space, plus a rooftop terrace and event space with full views of the neighborhood. CocoWalk will set aside about 250 parking spaces for its office users, which breaks down to 3.4 spaces per 1,000 square feet, Roth said. “We didn’t buy CocoWalk to keep it as it is today. We really feel it needs to blend better with the rest of Coconut Grove,” Roth told TRD. In recent years, new tenants like Büro Coconut Grove, Panther Coffee, Harry’s Pizzeria, Kit and Ace and others have moved in to the Grove and revitalized the market. And on the residential side, luxury condo developments like Grove at Grand Bay, which opened last year, Park Grove, the Fairchild and the Arbor Residences are also in the works. The last office building to be built is the SBS Tower at 2601 South Bayshore Drive, which was completed in 1989. 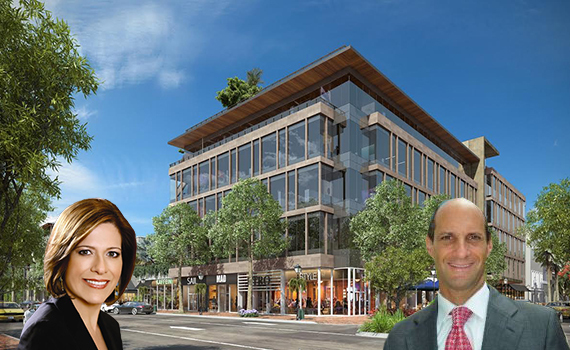 And the vacancy rate in Coconut Grove fell to 1 percent during the fourth quarter of 2016, according to Blanca Commercial Real Estate, which is exclusively handling leasing for the building. Construction on One CocoWalk is slated to begin in early 2018. Tere Blanca, president and CEO of Blanca, said demand is so high for Class A space in the Grove that she’s already in contact with potential tenants, especially business owners and entrepreneurs. Asking rents will be in line with market rates for trophy, Class A space in markets like the Greater Downtown Miami area, which sees rents in the range of $53 per square foot to $63 per square foot, she said. Office tenants like Sapient, which in 2013 inked a longterm lease for 54,000 square feet at the nearby Mayfair in the Grove office and retail complex, Sony Music and Büro have contributed to the area’s success, Roth told TRD.